Shrivenham is a very ancient place. During archaeological excavations, prior to the building of the bypass, it was found that the area was seasonally occupied by both Neolithic and Mesolithic people. The first permanent settlement appears to have been established during the Iron Age when round houses, associated with animal enclosures and ditches, were built. Romans hid a coin hoard in Bower Copse during the third century, but there is little other evidence of their residence in the parish. Eventually, a Saxon village was established and their 6th century graveyard has been dug up. The bodies included a warrior with his spear. The place became known as 'Scriveham,' a name of debatable origins: possibly the Sheriff's Home, the Shriving (Pardoning) Home or just the Home of a man named Scrifena (which seems rather unimaginative). When a church was built, it became a Saxon Minster which sent priests out to preach in the local area. The parish consists of numerous manors, some of which pre-date the Norman Conquest: Shrivenham Salop, Stalpits, Beckett, Fowersmill, Bucklands, Clay Court, Watchfield, Fernham, Bourton and the Rectory (including Longcot). The last four are, of course, separate villages. 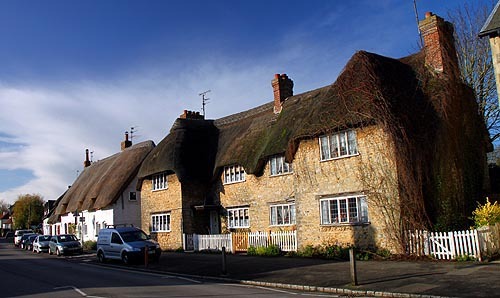 Beckett had its own village in medieval times, but the Barringtons demolished it in the 18th century because it was too close to their home. In the 14th century, the Beckett family owned it. They were obliged to pay two white capons to the King whenever he should pass by Fowersmill Bridge, saying, "See here, Sir, these two capons you shall have at some other time, but not now"! Fowersmill Manor was held by the service of 'making the fire in the King's chamber'. In the 13th century, the village was granted a weekly market on Thursdays and an annual fair on St. Mary Magdalene's Day. The families who lived the manor houses dominated the lives of the ordinary Shrivenham folk. The Rectory Manor was originally owned by Cirencester Abbey. The abbot had a house there, but he would have rarely visited, if ever. It was an important dairy grange, making butter and cheese as well. At the Dissolution, it was purchased by a younger branch of the famous Pleydell family from Coleshill. The family died out in 1768, but their heirs, the Bouverie Earls of Radnor, then combined the name with their own. The main local gentry, however, lived at Beckett House. In the 15th century, it was the Shottesbrookes, the Rogers and then the Essexes. Although, often residing there, it was something of a second home. Sir William Essex preferred Lambourn Place, but it was from Beckett that he got into trouble, in 1536, for distributing rebel demands around the county. In 1633, the place was sold to the judge, Sir Henry Marten, but it was his son, Henry Marten the Regicide who made Shrivenham notorious during the Civil War. He was a republican in the extreme and didn't like Cromwell any better than the King. During the Second Civil War, he raised an unofficial cavalry regiment of levellers with the intention of opposing Parliament should they recall the Monarchy. They rampaged round the local countryside, stealing horses from, not only travellers, but also Marten's neighbours. He was good to the villagers though and built them the almshouses in Claypits Lane in 1641. In their book on 'Tudor & Stuart Shrivenham,' Dils & Schwartz give us a glimpse of the life of ordinary Shrivenham folk during this period, as they jumped in and out of bed and beat each other up. For example, in 1571, John Blagrave and Elizabeth Chamberlain were caught in bed together by the latter's maid when they made too much noise! In 1598, a certain Robert Bridges attacked William Brown with his sword. Another Blagrave, Elizabeth, a widow who lived nearby, somehow got involved and had her arm cut for her trouble. Unfortunately the reason for the clash was not reported. However, as the authors point out, such incidents were very uncommon. Henry Marten eventually sold Beckett to his friend and fellow leveller, John Wildman. His son adopted John Shute, later Barrington. His famous family, who rose to be Viscounts, were patrons of the village until they sold up in 1936. The family have many monuments in the parish church and the Barrington Arms still stands in Shrivenham. Isambard Kingdom Brunel stayed there when planning the London to Bristol railway line. Shrivenham Station opened in 1840. It was from there that Thomas Hughes’ hero set off for Rugby in Tom Brown’s Schooldays. In 1936, a famous train crash occurred nearby. A broken goods train was stopped on the line when an express passenger train smashed into the back of it. The engine and the following three carriages were derailed. Those made of wood were smashed to pieces. Unfortunately, the driver and one female passenger were killed. The station was closed in 1965.